Jared Kushner told the crowd at the opening of the U.S. embassy in Jerusalem Monday that he was optimistic about the prospects for peace in the area, even as reports emerged that Israeli soldiers killed over 41 Palestinians at the Gaza border who were protesting the very event at which he was speaking. “We believe it is possible for both sides to gain more than they give so that all people can live in peace, safe from danger, free from fear, and able to pursue their dreams,” Kushner told the crowd. Kushner, the President’s son-in-law and senior adviser, has been tasked with overseeing Israeli-Palestinian peace efforts. But Kushner’s comments — a rarity in themselves, given his infrequent public appearances — came shortly after violence erupted at the Israel-Gaza border. Israeli soldiers shot and killed at least 41 Palestinians protesting the Trump administration’s decision to move the American embassy from Tel Aviv to Israel, according to the Associated Press. The Israeli military said on Twitter that thousands of protestors were “hurling firebombs & explosive devices, burning tires, throwing rocks, & attempting to ignite fires in Israeli territory.” According to the AP, at least 772 protestors were wounded, with at least 86 in critical condition, marking the deadliest day in Gaza since the last major fighting nearly four years ago. “As we have seen from the protests of the last month and even today, those provoking violence are part of the problem and not part of the solution,” he said. The comment was not included in the excerpts of his remarks delivered to the press ahead of time. 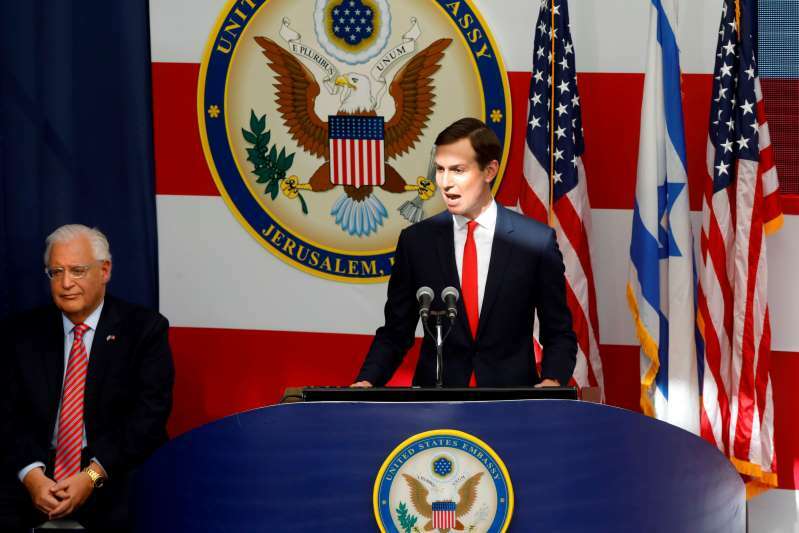 Kushner was among the delegation from the White House attending the opening of the embassy, which was led by Deputy Secretary of State John Sullivan. He was joined by his wife Ivanka Trump, Treasury Secretary Steve Mnuchin, U.S. Ambassador to Israel David Friedman, and U.S. envoy for Middle East negotiations Jason Greenblatt. Several Republican lawmakers, including South Carolina Senator Lindsey Graham and Texas Senator Ted Cruz, were also in attendance.